I've made a deal with Kiwi to offer his flies on the TenkaraBum site. Anyone who's participated in one of the fly swaps he's been in knows the quality of his flies. That quality, and his innovative patterns, were recognized when he won second prize at the fly tying contest held by the Montana Fly Company and the Outdoor Bloggers Network. I think he would have won first prize, but the first prize was a fly reel, and it would have been a bit of an insult to give it to a tenkara angler. I suppose to save face all around he was awarded second place. Kiwi's tenkara flies are $7.50 for three. Purchases of one dozen or more flies will be shipped in a 6-compartment minimalist fly box. Domestic postage for the flies is $4. International shipments require additional postage. 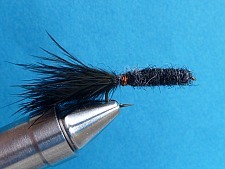 The Black Killer Bugger was developed as a simplification of the Woolly Bugger, which over time morphed to the point where the emphasis seemed to be on the palmered hackle rather than the chenille body and marabou tail. The Woolly Bugger was originally developed to represent a hellgramite, which has numerous appendages down its sides, but they are very short and certainly not prominent.The modern Woolly Bugger really looks nothing at all like a hellgramite. The Killer Bugger is a cross between the Killer Bug and the original Woolly Bugger. 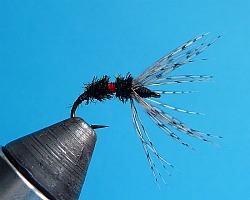 Despite having no hackle at all, a Killer Bug very effectively represents a scud, whose legs are more prominent than the appendages on a hellgramite. Similarly, the legless, hackleless Killer Bugger is a very effective representation of a hellgramite - or maybe its a leech - or maybe a fairly dark sculpin. I am sure the trout (and bass, and bluegills and the 50 other species that it caught in the TenkaraBum "What can you catch with a Black Kller Bugger" Challenge) only know that it looks like something they want to eat. This is really a very effective fly. If you haven't ever fished with one, do yourself a favor and give it a try. 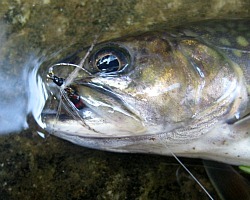 The Royal Coachman is an attractor pattern as it does not represent any natural food that trout consume. This has not detracted from from its effectiveness because it is one of the few classic wet flies that is still in use. The distinguishing features of a Royal Coachman are the peacock herl body with red band in the middle made of silk or floss. It also has a white wing and brown hackle. This pattern has been so effective that it has given rise to numerous variations based on scheme of materials and colors. Among them are the Royal Trude, Royal Bucktail, Royal Streamer, Fanwing Royal Coachman, Royal Humpy, and last but not least, The Royal Wulff. Kiwi has introduced another member to the family. He calls it the Royal Sakasa Kebari. 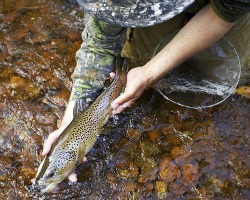 It has proved extremely effective on small stream brook trout and bluegills. Part of the fun in tying one's own flies is to learn a little something about where a particular pattern came from and why it was used. The Royal Sakasa Kebari family tree can trace it's roots to ancestors in Europe, Japan and 19th century America. What is truly amazing though is how they all come together to form a beautiful little fly that can help bring a brookie to hand and give me a perfect day on a small mountain stream." The Royal Sakasa Kebari is tied on a size 12 Mustad C49S hook. The Killer Bug has been my best catching fly ever since I started tying it, and it has been my best selling fly ever since I started selling it. Unfortunately, I have gotten busy enough that I just haven't had time to tie. 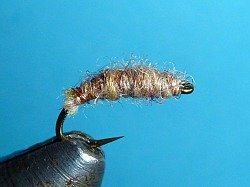 I feel extremely fortunate that Kiwi not only shared my passion for this fly but also that he has agreed to tie it for sale on the TenkaraBum site. The only difference between the way I tied it and the way he ties it is in the choice of hook. I tied it on several hooks, the Daiichi 1560, 1120 and 1190. 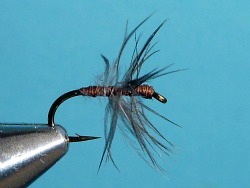 Kiwi has adopted the simplicity of tenkara to his tying, and ties all his flies on the same hook - a Mustad C49S, size 12. I can assure you (as can he) that the fly works just as well on this hook. 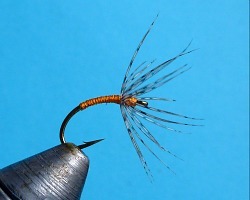 Much has been made of the manipulation given to tenkara flies, particularly the reverse hackled sakasa kebari. I think it is important to note that the same manipulation can be given to a Killer Bug. It is true that the Killer Bug has no hackle to open and close, but it is also true that scuds can swim, and the manipulation of the Killer Bug thus imitates the actual behavior of an actual food source. Dead drift or with manipulation, the Killer Bug works! I've known for some time that Kiwi shared my passion for the North Country Wets, those almost ethereal flies that have been catching wild brown trout in the north of England for at least as long as tenkara anglers have been catching wild amago in the hills of Japan. Consisting of no more than a wisp of feather and a bit of silk, some of the North Country patterns are as simple as any kebari. Kiwi has blended the silk and partridge of the classic British North Country Wets with the reversed hackle of the classic Japanese Sakasa Kebari. I know for a fact that the combination works. The largest trout I've ever caught was fooled by a simple Partridge and Orange Sakasa Kebari. Although it was one of my ties rather than Kiwi's, the only difference is the hook. I used a Daiichi 1120 and Kiwi ties his on a Mustad C49S. The silk body darkens when it gets wet. The orange silk, which looks so bright when dry, becomes a burnt orange when wet that must mimic some food source pretty well because it is a very effective fly. The Partridge and Orange soft hackle did not get to be a classic because of some Madison Avenue marketing campaign. It catches fish and has for centuries. The Stewart Spider (or more precisely, Stewart Black Spider, because WC Stewart created a Red and a Dun Spider) is one of those flies that just seems to work everywhere. It's a fairly small, nondescript, very buggy looking - thing. Fished wet, it imitates nothing in particular but represents everything from a midge to a small black caddis to a black gnat or even a small mayfly nymph. It is a soft hackle fly made with a starling feather, and the soft hackle will pulse enticingly with any twitch of your line. Sounds like an ideal tenkara fly. WC Stewart's description of it reminds me of Dr. Ishigaki's description of his one and only fly.